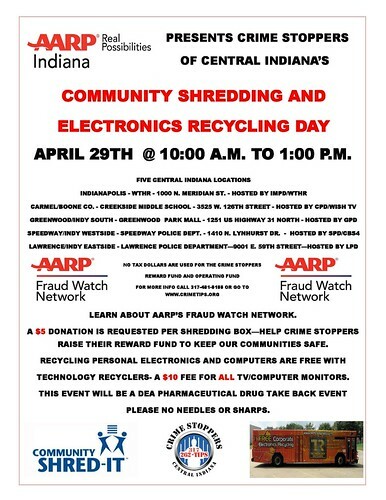 Join the Speedway Police Department once again for the Spring Shred-IT and Electronics Recycling Fundraiser for Crime Stoppers of Central Indiana. They are a 501(c)3 non-profit that helps law enforcement find wanted felons and solve open felony cases. Please come out and get rid of that stuff you don’t want any more or don’t want anyone to get their hands on and help Crime Stoppers of Central Indiana! Even with race season coming to a close with the Red Bull Air Race, October is shaping up to be a busy month for the Speedway Police Department and Citizens Academy / Volunteers in Policing. The 8th Citizens Academy Class is underway and students are again having a fun and informative time! In addition, we will be hosting or participating in the following events in October. The Speedway Police Department will be holding its National Night Out event on Tuesday, October 3rd from 5:30 – 7:30 PM at Leonard Park. We hope you’ll join us for some food & fun. Lt. Sam Alexander invites Speedway residents to join SPD at National Night Out! On Saturday, October 21st, the Speedway Police Department will again host a location for the next Community Shredding and Electronics Recycling Day, to benefit the CrimeStoppers Reward Fund. See flyer below for details (click image to enlarge). On Saturday, October 28th, We will again be participating in the Speedway Chamber event, Trunk or Treat, an event which has been growing over the past several years and is a lot of fun! Please note the new location at the American Legion on Georgetown Road. The next Community Shredding & Electronics Recycling Day will be held on Saturday, April 29th from 10AM-1PM at the Speedway Police Department. Please see attached flyer for additional details. Once again, CrimeStoppers of Central Indiana will hold its semiannual Community Shred-it Day on Saturday, October 22, 2016 from 10AM – 1PM at five central Indiana locations, including the Speedway Police Department. Save your documents to be shredded, along with electronics. Please click the flyer below for complete details. Money raised goes to helping the community’s safety for the CrimeStoppers reward fund – and of course, prevent identity theft by disposing of your sensitive documents securely. Shop at AmazonSmile and support Crimestoppers of Central Indiana! Did you know you can help your local law enforcement officers fight crime just by shopping? It’s true! Crimestoppers of Central Indiana is an independent organization in Central Indiana that works with local law enforcement agencies to provide information on crimes to the public for the public to anonymously report any information about the crime and criminals. The organization is a part of the AmazonSmile program, which is an easy, no cost automatic way for anyone to shop at Amazon and have 0.5% of your purchase donated to the charity by the Amazon Smile Foundation. There is no cost to either the charity or to the shopper. To start shopping and helping Crimestoppers Central Indiana, just click this link http://smile.amazon.com/ To select a charity, just search for Greater Indianapolis Metropolitan Crimestoppers Inc, and select. After you have selected them, just make sure to always shop at http://smile.amazon.com/ and you will be helping fight crime in Central Indiana!